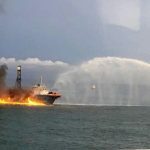 The 60 meter long research vessel Geos caught fire off Kuala Baram, Malaysia. 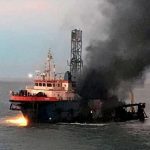 The fire started after an explosion in the engine room while doing offshore oil exploration. The fire quickly engulfed the research vessel forcing the crew to jump overboard into the sea. Authorities were alerted and quickly launched a search and rescue operation. Rescuers arrived on scene all pulled 37 of the 38 crew to safety. Two crew sustained injuries and were taken to hospital for treatment. One crew person was reported as missing. 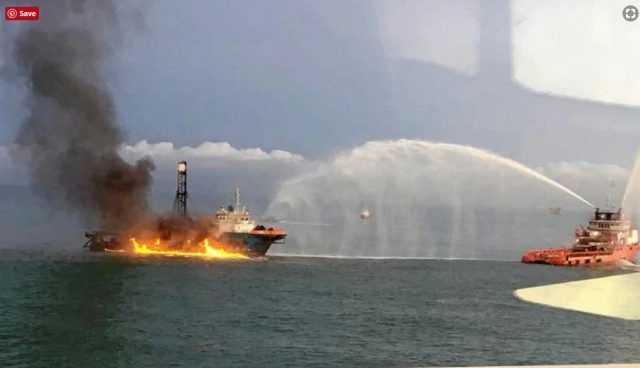 Several tugs arrived a short time later and began to extinguish the blaze on the Geos. 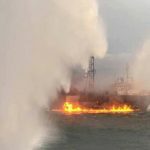 The tugs were able to contain the fire, but reports state there were several areas within the superstructure still on fire. 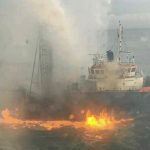 Fire crews were expected to board the vessel and continue to extinguish the blaze. Reports state the owner and authorities have launched an investigation into the incident.